It takes very little honesty for each of us to acknowledge the fact that even the religion we subscribe to is not completely ‘belief-free’. What is a belief? A belief is an unverifiable or unprovable (here and now) idea that our mind willingly subscribes to. A sincere, open-minded read into the Holy Books of all major Religions immediately makes evident one thing, that without exception, all of them have in them ideas which are immediately unverifiable and without immediate proof. We believe in a set of ideas presented by the Religion of our choice and believe staunchly too. No harm in that for, all that is important is if a particular belief system sits well in our intellect and thereby helps further our growth, development and evolution. Some people charge ‘believers’ as being fools for believing without proof! But their very ‘non-belief’ is as much a belief (in the opposite of course) and as invalidated too for, what can’t be proved can’t be disproved either! Whether it is a belief in an eternal heaven and eternal hell as subscribed to by the Abrahamic religions or the belief in the doctrine of karmA and rebirth (which is quite the opposite) as subscribed to by Eastern religions or a total non-belief in anything, everyone is entitled to hold onto his set of beliefs freely without disturbing and disrupting others. The true, vedic intention for religion is to serve as a ‘means’ rather than the ‘end’ itself. 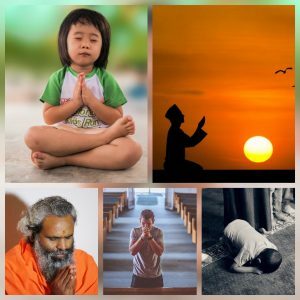 When Religion is the ‘means’……..
……..it serves as a powerful tool to polish, strengthen and makes clear a mind and also helps keep man’s overactive ego under check through prescriptions in the form of prayer, worship and austerities. When we scrutinize the actual process of worship of any Religion, the body language symbolises surrender in any which way whether with folded hands, kneeling down, prostration, etc. While every other secular action only strengthens and feeds man’s ego to become bloated and overactive, sacred actions accomplish the exact opposite by softening the ego and going as far as sometimes even bringing out the beggar in us (when we beg and plead for blessings)! Any growth involves giving up a prior condition to assume the next, like giving up youth to grow into middle age, giving up anger for love. Similarly, to grow spiritually involves giving up prior attitudes and ideas surrounding religion and adopting a conducive, unselfish attitude to aid spiritual evolution. When Religion is the ‘end’………..
……..it leads to chaos, confusion, and even killing in extreme cases because one becomes so strongly identified at the level of religion and is therefore incapacitated to think beyond, “I am Muslim”, “I am Christian”,etc. Religions are many and their prescriptions vastly varying all owing to customs, traditions, time period, culture, circumstances, etc. surrounding where the religion was born. Even within a religion practices sharply differ as seen even within vedic religion. Vedic religion is not the “one size fits all” kind! We are allowed to pick practises and kind of devotion that appeals to us based on our mental makeup but the only condition is, we are expected to grow from there forwards! 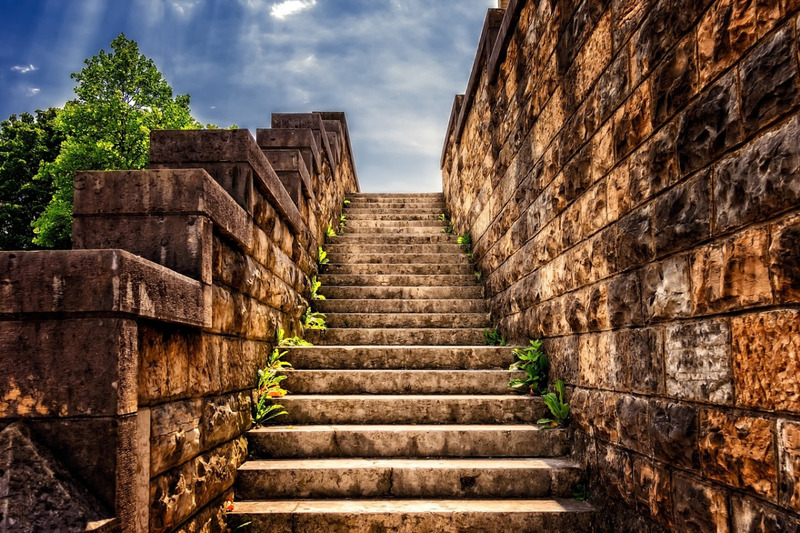 Scripture asserts that no matter what path we choose, when one sincerely strives on with committment, that will automatically purify one’s mind enough to lead one to the Truth. Unfortunately, this is where we humans hit the biggest obstacle. The mind deceives, distracts and distances us from others by making us overly identified with things like the path/religion itself, its practices, its heads/teachers, etc. All these certainly have to be respected, valued and followed with utmost respect, loyalty, sincerity, dedication and commitment but while doing so, if it slowly starts evoking hate and disrespect for those who are not on the same path, that becomes cause for our mind to retrograde instead of evolve. Afterall, a mind that holds onto hate or anger is like the wick of a candle which nothing but self destroys! There is a very huge enclosure with thousands of people all over. There is only one exit to the North. Each one is given a compass and asked to follow its guidance to help exit out North. Based on every person’s relative position in the room, each one gets a different prescription in terms of path to follow. All the wise, thinking people in the room quietly follow their own prescriptions and exit out. But some meddling people, not understanding that not following ones own prescription based on relative position cannot help one make it out, force their prescription on others who they ‘presume’ are lost/confused! The need for the hour is World Peace! For collective peace to become a possibility, every individual has to learn to be at peace with himself first! Religion, when practised mindfully by conscious, caring, peace loving individuals only serves as an opportunity for peace, growth and more learning. While driving a car, the onus is completely on the conscious driver to drive with utmost caution and safety and certainly not on the car. Practicing Religion is really no different from driving a car! Religion itself is just a broad framework/guideline to base our life and actions on. Onus is completely on us conscious individuals who practise it, to do so in a safe, unhurtful manner furthering love, growth, tolerance, kindness and peace. Selfishness is not something foreign to us and this would be the ideal context to worry about our growth alone. Peace will automatically follow such selfishness! So for those of us who practice religion, let us allow it to do its job by opening our hearts and minds to love and accomodate one and all beyond all differences. Let us use it as a tool to help weaken the ego. When Religion has thus been used with deliberation, spirituality steps in as a course of natural progression. Like the wise say, religion helps weaken man’s ego and spirituality cuts asunder that ripened ego, thus freeing man! Religion has served its true, complete purpose when it elevates our standpoint of identification/life perspective even as we continue practising and staying in it. Its like running on a treadmill on the exact same spot and at the end of the hour, inspite of being exactly where we began, we have covered a distance of 6 miles! Religion has served its highest purpose when it elevates our identification to “I am a living being” (not even ‘human’ for in that there is room to discriminate plants and animals) rather than “I am a Hindu”, “I am a Muslim” etc. even as we continue to stay within its fold practising it. 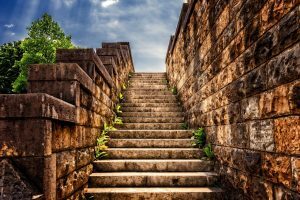 Every path/religion/practice is to be used as stepping stones or a flight of steps to take us to the Higher. Whether you get there first through your ‘highway to Heaven’ or I go first taking the slow, scenic route isn’t the point, THAT we go is of utmost importance! This entry was posted in Priya and tagged belief, devotion, ego, faith, love, peace, prayer, religion, spirituality, Unity, worship by Priya Umesh. Bookmark the permalink. I’m not sure I understand the metaphor here, Priya. What does the nut represent exactly? Is the ‘inside’ of the nut the ‘explanation’ for the nature of reality? You see, as I think I admitted earlier, I have never felt that ‘religion’ (as I understand it) offered any reasonable, acceptable explanation for ‘life, the universe and everything’. And, as far as I have encountered religious people or read about religion-related world events in the press, it seems to me that those people who are seriously religious rarely try to really find out about the true state of affairs (i.e. as revealed by Advaita). Rather they reach the stage where they accept the dogma presented by their particular religious ‘story’ and do not feel the need to go beyond it. They then either feel sorry for anyone who does not share their belief or they try to convert them or, in the extreme, fight them. It has always seemed far more reasonable to me to reject ALL religions and use science and philosophy to question one’s experience, and use reason to arbitrate amongst the various ‘options’ put forward. Of course, I eventually discovered Advaita and learned that it IS necessary to accept some ideas provisionally, even if they cannot be corroborated via the usual means (perception, inference etc), until such time as one realizes that they must be so. Religious beliefs seem to be helpful only to the extent that they can provide explanations for things that science may not yet be able to explain fully. One ‘believes’ only until such time as what was believed in is realized to be mithyA. 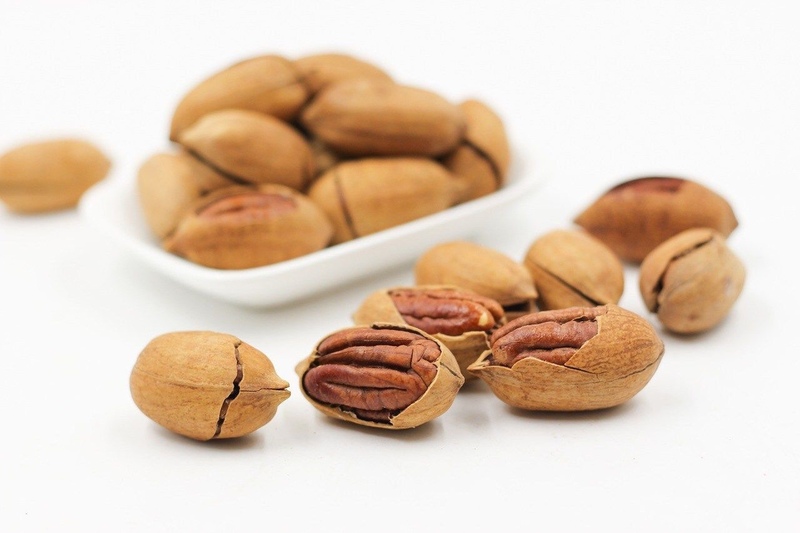 Dennis ji, Yes, the point i’m trying to make through the metaphor is, a nut serves its purpose only when the shell is cracked open and the nut is accessible. Similarly, Religion presents itself to us through practises, beliefs, a God. However, none of them have served their purpose until the nature of the entity called God is cracked open with the tool of vedAntA! So yes, the nut inside is synonymous to getting down to the nature of IshvarA. Interesting, looks like we have approached vedAntA from diagonally opposite directions! Yes I so agree with you, when one becomes unquestioningly absorbed in the dogmas of their religion, the scope for any questioning what so ever is shut out. I was lucky since I swung somewhere between neither an Ateist nor a total believer. I needed answers for everything I indulged in and when religion no longer could provide answers, guess the automatic progression was to the philosophy behind it. I am thankful and blessed for it has completely redefined my devoton and the way I view life. Based on the last para of your comment, if you don’t mind, may I please ask, what was it about religion that you couldn’t come to terms with? Was it the very existence of a God or particularly how God was defined? I’m curious to know! I guess it was the anthropomorphism inherent in the way in which religion is usually taught. I could never accept the idea of an all-knowing, all-powerful, super-human entity directing things from ‘on high’. It seemed like a naive mind providing pseudo-explanations for processes that it did not yet understand, like a thunder-god wielding lightning bolts etc. You can read a pretty thorough, four-part interview I gave to Non-Duality magazine begining at http://www.advaita.org.uk/interviews/dennis_waite1.html. This should cover most of your ‘background’ questions. I would disagree that karma yoga needs to involve religion at all. I effectively practised this for many years and even used the words (mentally) ‘OM paramAtmane namaH’ before beginning focussed action, but I never had any sense that there was a god monitoring/responding to this. And I still do not feel any need for this. I think that the majority of Western seekers do not easily adopt a religious attitude and I want to reassure them that this is not essential. When you say ‘a religious attitude is not essential for a seeker of advaita vedAntA’ what does ‘religious attitude’ exactly define? Is the suggestion therefore that advaita vedAntA can be approached with just intellectual readiness and/or curiosity alone as is the case with all other material Sciences(aparA vidyA)? I’m still unable to piece in IshvarA/dharmA in the whole scheme based on your interview answers? When you chanted ‘OM paramAthmanae namaH’ what was the object of dedication? Is there room for a karma phala dAtA at all in this scheme Dennis ji? (For me) a ‘religious attitude’ is simply the feeling (unconfirmed belief) that there exists some ‘superhuman entity’ that is responsible for creation (us and the universe) and somehow guides/rewards/punishes our action. You don’t require this concept in order to believe that we are not the body-mind. That there is only non-dual Consciousness in reality can be accepted without the interim belief in a mithyA ‘god’. In fact, it seems that it is probably easier for a seeker who starts from this position than for one who begins from a ‘religious’ standpoint. I don’t see the need for a ‘dAtA’ – this is anthropomorphism again. It is reasonable to accept that there is a cause-effect relationship for action, without the need for a god to administer it. In reality, of course, karma is a ‘convenient fiction’, as I think Eliot Deutsch described it; part of the adhyAropa-apavAda teaching. It obviously functions very well as a motivator for seeker and non-seeker alike! The ‘chant’ was as instructed by the school (SES) that I was attending. I saw it as part of the ‘focussing’ process. It alerted the mind to direct attention and be aware of what was happening, turning off the constant ‘thinking’ that the mind usually engages in. Indeed, the chant could have been any set phrase for this purpose as long as this association was in place. In this respect, it functions rather like the mantra used in japa meditation (which I also practised for many years).